China’s air pollution is infamous. The haze can make it impossible to see buildings across the street, and the pollution forces schools to close and creates health and morbidity problems, in addition to tremendous environmental degradation. However, China also faces another important environmental problem, which is less well-known to the public: that of soil degradation and pollution. 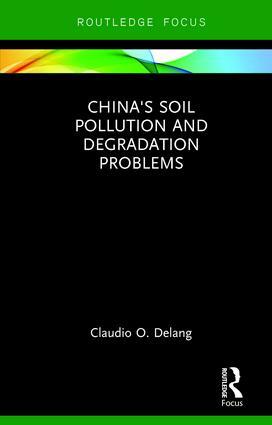 This book provides an overview of the problems related to soil degradation and pollution throughout China, examining how and why current policy has fallen short of expectation. It also examines the challenges faced by policy makers as they attempt to adopt sustainable practices alongside a booming and ever-expanding economy. China's Soil Pollution and Degradation Problems utilizes grey literature such as newspaper articles, NGO reports and Chinese government information alongside academic studies in order to provide an extensive review of the challenges faced by grassroots organizations as they tackle environmental policy failings throughout China. This book will be of great interest to students of environmental pollution and contemporary Chinese studies looking for an introduction to the topics of soil pollution and soil degradation, and for researchers looking for an extensive list of sources and analysis of China's environmental problems more broadly. Claudio O. Delang is Assistant Professor in the Department of Geography at Hong Kong Baptist University, Hong Kong.